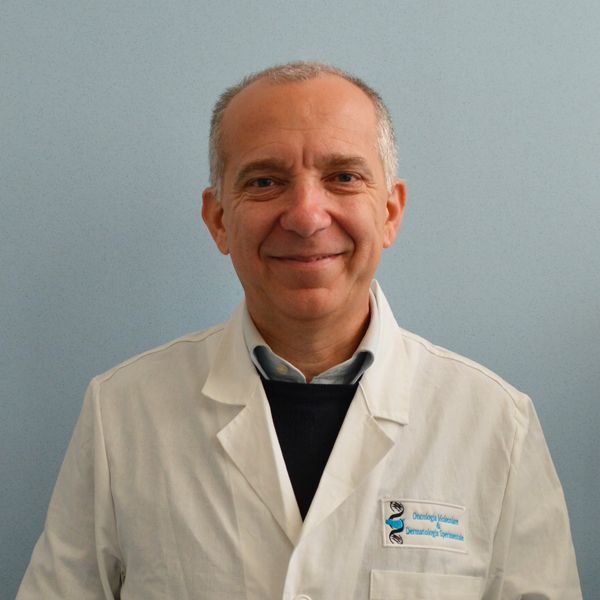 Professor Giorgio Stassi MD started his research activity in 1989 as researcher with the Laboratory of Immunological medicine at the Institute of Clinical Medicine of the University of Palermo. In 1997 he started work at the Rangos Research Center (PA) USA, under the supervision of Prof. Trucco and working on the pathogenesis of Diabetes Mellitus. He returns to Italy in 2000 and thanks to a AIRC financing, was able to create a Laboratory of Cellular and Molecular Biology at the Department of experimental Medicine at the University of Palermo. In 2002 he takes position as Head of the Cellular and Molecular Pathophysiology Laboratory at the Department of Surgical and Oncological Sciences of the University of Palermo. In the last years his scientific interest has been focused on the study of the role that cancer stem cells have in the onset and the progression in different tumors of epithelial origin such as colon, breast and thyroid tumors. Recently, Stassi and his collaborators published a series of articles on top journals such as Cell Stem Cell and Nature in which he clarified one of the main mechanisms in regard to the resistance to chemotherapy of the cancer stem cells of the colon and proposing a new strategy for the cure of these tumors. He has brought mechanisms to light that regulate epithelial tumor cells’ survival and resistance to conventional therapy. These results have significantly contributed to cancer research, allowing him to issue a patent that enables the development of innovative cancer therapies. He was appointed one of the first to isolate stem cells from colon and thyroid tumors. The advanced development of this system has ulteriorly confirmed its innovative contribution to cancer research leading to attractive discoveries, which have paved the way to designing new “tailored” and more effective anti-cancer strategies. Recently, he identified CD44v6 as a colon cancer stem cells (CSCs) marker required for the metastatic potential of CSCs. Moreover, he has established that the tumor niche reprograms CD44v6- CRC progenitors in metastatic CD44v6+ stem cells concluding that CD44v6 is an independent negative prognostic marker. He determined that CD44v6 cells are dependent upon the activation of the PI3K/AKT pathway. PI3K promotes the expression of CD44v6 in colorectal cancer progenitors, while its inhibition impairs migration and survival of CD44v6+ CRC cells. On the bases of these results, a clinical trial with available drugs that target the PI3K pathway, has been designed for CRC patients. Colorectal cancer (CRC) is the third leading cause of cancer death in Western countries. Despite improvements in therapeutic regimens and knowledge advancement regarding primary tumors, the mortality rate of CRC cancer remains high due to unavailable treatments that target the metastatic spread. Actually, CRC metastasis is the main cause of cancer-associated deaths. Thyroid carcinoma is the most frequent type of endocrine cancer with a notable increase in incidence all over the world . Papillary (PTC), follicular (FTC) and anaplastic (UTC) thyroid carcinomas arise from endodermal-derived follicular cells, which represent the most abundant cellular population of the thyroid gland. Characterized by rapid growth, local invasion, regional and distant progression, UTC has the highest aggressive clinical outcome and unfavorable prognosis. The systemic nature and the resistance capability of disseminated tumor cells to existing therapeutic agents, could explain why 90% of cancer mortalities are attributable to metastases. Based on these observations, our laboratory is focused on studying the biological program that enables resident Cancer Stem Cells (CSCs) to acquire a number of traits required to accomplish the fundamental steps in initiating the metastatic cascade. For most cancers, the target cell responsible for transforming mutations is unknown. Considerable evidence states that certain types of leukaemia arise from mutations which accumulate in hematopoietic SCs. This observation mostly reflects the need to better understand the oncogenic events which occur in tissue-resident stem cells in order to explain the transition from non-malignant hyper-proliferative lesion to well established cancers and translate the identified mutations into new therapies. We study the initial events leading to thyroid tumor growth and the tumour-related molecular alterations, which characterize the tumor’s behavior. CSCs have shown to possess an unlimited proliferative potential. These cells are responsible for the development of the tumor and represent the only cell population able to sustain tumor growth. Metastases spawned by the primary colon cancer is activated following the completion of molecular events attributable to CSCs. The mechanisms underlying colon cancer metastatic events, are far from being completely comprehended and it is still unclear which cell subset is able to migrate, survive and grow at the metastatic site. The inefficacy of conventional therapies in association with the CSC population, might explain cancer chemo-resistance and the high frequency of relapse and progression, shown by the majority of colon cancers. The CSC model suggests that it may be necessary to alter the current paradigm used in drug development. The eradication of cancers may require the targeting and elimination of CSCs, in order to improve therapeutic outcomes for patients that are affected with even the most advanced cancers and to prevent recurrence and metastases. 1998-2000 Grant Telethon: (E.735) “Molecular events controlling the pathogenesis of Hashimoto’s’ Thyroiditis”. 2001-2003 Grant AIRC: “Molecular events controlling cell survival in thyroid cancer. 2003-2005 Ministero della Sanità 1%: “Tumori Tiroidei: Meccanismi Molecolari e Nuove Strategie Terapeutiche”. 2003-2005 Cofin 2003: “NF-kB role in the anti-apoptotic molecules expression mediated by Th2 cytokines”. 2003-2005 National Program on Stem Cells: Role of apoptosis in B-chronic lymphocytic leukaemia (CLL) and chronic myeloid leukaemia (CML) stem cells. 2004-2006 Grant Ministero della Sanità 1%: “Sviluppo di prodotti biotecnologici per la terapia delle neoplasie ematologiche. 2004-2006 Grant Pfizer: “Statins and apoptosis regulation: effects in auto-immune diseases”. 2004-2005 Grant AIRC: Molecular Events Controlling Cell Survival and Chemotherapy Resistance in Solid Tumors. 2005-2007 Grant Ministero della Sanità 1%: Istiocitosi e Tumori. 2005-2007 Cofin 2005: “Identification of molecules involved in cancer stem cells survival”. 2006-2008 Grant AIRC: Molecular Events Controlling Cell Survival and Chemotherapy Resistance in Solid Tumors and Cancer Stem Cells. 2007-2010 Grant Ministero della Sanità: – Direzione Generale della Ricerca Scientifica e Tecnologica- Programma Straordinario Ricerca Oncologica. “Molecular mechanisms controlling cancer stem cells survival. 2007-2008 Programma Italia-Usa: “Farmacogenomica Oncologia”-Oncoproteomica. “Ruolo delle fosfoproteine nella chemioresistenza delle cellule staminali tumorali di colon e retto con analisi comparativa immunofenotipica”. 2008-2010 Grant Ministero della Sanità: – Direzione Generale della Ricerca Scientifica e Tecnologica- Programma Ordinario Semplice. Stem Cells in different pathological conditions: innovative therapeutical approaches. Stem cells have the ability to preserve themselves through self-renewal as well as the capacity to generate differentiated cells. Being that cancer is considered an unregulated and self-renewing disease, understanding the molecular events controlling this process is fundamental for the identification of those mechanisms that underlie cancer cell proliferation. Although it was postulated that tumors may often originate from stem cell transformation, the target cell of transforming mutations, is still unknown. Nonetheless, stem cells are still the sub population with a high probability of transformation for two reasons: i) susceptibility of already activated self-renewal machinery in gaining a further aberrant activation; ii) opportunity of accumulating mutations in individual stem cells that persist for longer periods of time when compared to most other mature cell types. Therefore, this project proposes to identify the genetic changes which occur in stem cells that leads to their transformation into cancer stem cells (CSCs). We will evaluate the capability of transformed stem cells to strictly regulate self-renewal and create a xenograft tumor, which morphologically and genomically resembles the original patient’s tumor and exhibits individual heterogeneity. The self-renewal mechanism could be even more pronounced in CSCs that have been shown to be particularly clonogenic. Recent evidence hints at the possibility that many pathways, classically associated with cancer, may also regulate normal stem cell development. The insurgence of metastasis accounts for 90% of deaths in patients with colon cancer. Tumor cells responsible for metastasis usually survive in a hostile environment and face potentially lethal conditions. This is a result from the sophisticated mechanisms that regulate homeostasis in humans. In particular, cells able to cause metastases must have an increased proliferating capability, a marked resistance to “harsh” environments (probably correlated with increased niche plasticity), a decreased tendency to apoptosis as well as altered adhesion and mobility properties. All these characteristics are present in tumor stem cells that represent the cell population most likely responsible for metastasis formation. Investigating the processes that lead to metastases and developing strategies able to prevent their formation, are major objectives in oncology. Although it is clear that larger and more invasive tumors represent a more efficient source of metastatic cells, the cell population able to migrate from the primary site and generate distant metastasis, remains largely unknown. We recently showed that colorectal cancer contains a small variable number of cells that express CD44v6. The latter are uniquely able to generate metastatic tumors in orthotopic xenograft models, whereas cells lacking CD44v6 can be tumorigenic, but are unable to produce metastasis or serial xenografting. While MET is widely expressed in CRC cells, CD44v6 is absent but can be induced by HGF, OPN or SDF-1, which are able to turn undifferentiated non-metastatic cells into metastatic ones. The main role played by CD44v6 in CRC spreading was confirmed by analysing two large cohorts of patient tumors. This demonstrated that high expression of CD44v6 is an independent negative prognostic factor in patient survival. Moreover, the targeting of either CD44v6 or MET, prevents migration and neutralizes the metastatic potential of tumorigenic CRC cells and therefore the control of tumor spreading. – Sensitizing cells for apoptosis by selectively blocking cytokines. US2006257401 – 2006-11-16. – Method for the purification and amplification of tumoral stem cells. EP1805299 – 2007-07-11. – Sensitizing cells for apoptosis by selectively blocking cytokines. EP1592449 – 2005-11-09. – Antibody specific for Human IL-4 for Treatment of Cancer. WO2007107349 – 2007-09-27. – Differential cytokine expression in human cancer. US2009324616 – 2011-12-29.